Only 13% of Egyptians support NATO's toppling of Gaddafi. "Residents in several North African countries, including Morocco (12%), Egypt (13%), and Algeria (14%) were the least likely to say they were in favor of NATO intervention." Look at Libya to see what may happen in Syria. "In post-revolutionary Libya there is only an apology for a central government and no rule of law, just heaps of armed men," writes journalist Peter Oborne, in Libya Notebook in the Spectator. Political analyst Dan Glazebrook, at Ahram Online, has written "Libya: the ongoing disaster". 1. NATO's destruction of Libya has paved the way for the military re-conquest of Africa. 2. At least 50,000 people were killed in the NATO attack on Libya. 3. Libya's former 'rebels' are now turning on each other and the mass killing continues. 4. $1.4 billion has already been paid out to the NATO's mercenaries who fought in Libya. 5. Corruption is becoming endemic in Libya. $2.5 billion in oil revenues is unaccounted for. 6. Libya's resources are now being jointly plundered by the oil multinationals and a handful of chosen families. 7. No supporters of Gaddafi are to be allowed to stand in the upcoming Libyan elections. 8. Law 37, passed by the NATO-imposed Libyan government last month, has created a new crime of 'glorifying' the former government or its leader, subject to a maximum sentence of life imprisonment. Law 38 guarantees immunity from prosecution for anyone who committed crimes aimed at "promoting or protecting the revolution". This immunity covers those NATO forces responsible for the ethnic cleansing of the town of Tawergha, the massacres in the town of Sirte, and the continuing widespread torture of detainees. 9. Libya's destabilisation has already spread to Mali. 10. Many of NATO's Libyan fighters have now been shipped to Syria to spread their sectarian violence there also. 11. AFRICOM - the US military's African command - recently decided to send its troops into the Central African Republic, Uganda, South Sudan and the Democratic Republic of Congo. 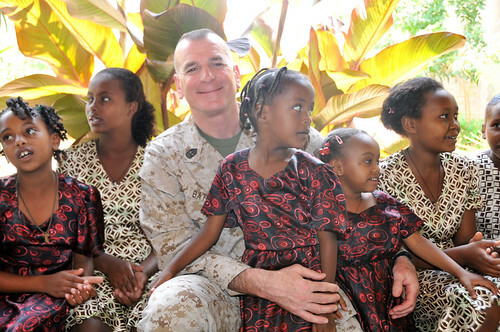 AFRICOM has now announced 14 major joint military exercises in African countries for 2012. The military re-conquest of Africa is rolling steadily on. None of this would have been possible when Gaddafi was still in power. Aside from all else wrong the invasion of Lybia and other African nations, the project is in breach of the US constitution's anti-imperial commerce, defence and treaty clauses. It is authorized by the federal imperial statute the War Powers Act of 1973 and statutes in similar vein. What is required is a judicial review by the US Supreme Court of this conflict of laws between the peaceful constitution and the genocidal federal imperial statutes. The classic case is ready-to-hand. See and support http://mightisnotright.org/.